There are so many opportunities for family photography in Rhode Island! The Ocean State has almost 400 miles of coastline. From the beaches to the inland forests is about 37 miles wide by 48 miles long. But there’s a lot packed into that little parcel of tourism. And Suzanna Fallon is there to show you the best photo venues to capture your family events and memories. Fallon Photographic Arts, LLC is based in Pawtucket, RI, just up from Providence. Suzana specializes in family photography, either on location or in studio sessions, in all of Rhode Island and Southern Massachusetts. Photography was something I have always enjoyed. I became a photographer because I love creating images with my clients that they will love and cherish for many years to come. What was once a hobby many years ago has led me to a wonderful career. Suzana works her magic with light and shadow for your engagement sessions, weddings, newborns, babies & children, family milestones and high school seniors. Currently she has a career in the medical device industry. But the plan is to work towards comfortably transitioning to full time photography within the next two years. To that end, Suzana does non-stop marketing through very active pages on Facebook and Instagram – we’d say it’s about to pay off big time. Managing her business while working full time has its challenges. However, family and friends support her goal and come together to help achieve it. Connecting and growing with clients has made Fallon Photographic Arts what it is today. It’s what gives Suzana the most satisfaction. Her many proud moments have mostly involved the happiness of her amazing clients. After all, connection and emotion are what led her in the first place to photography as a career. Several of her clients had booked Suzana for their weddings. Now, she’s photographing their newborns and children, following family milestones with love. Seeing my clients grow is an absolute honor. I tell a story through images. Those images are the documentation of important moments in someone’s life. It’s with these images that people get to relive the moments that matter. 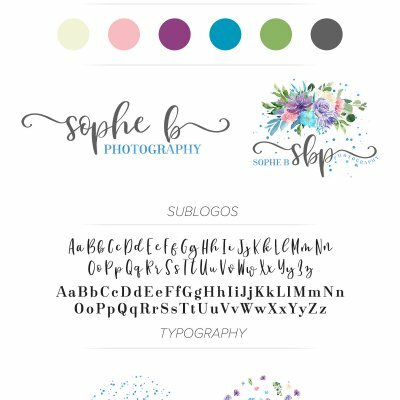 I decided to rebrand my business and the whole team at Autumn Lane Paperie has made the process incredibly seamless. For the next year, there will be a strong focus on newborn photography. So, I wanted my brand to reflect this. Prior to contacting ALP for the rebrand, I was completely lost on where to start. What I envisioned was easily brought to life by ALP. Through the phone calls, email communication and questionnaires, the magic was created. In addition to the rebrand, I am also working with ALP to revamp my website/blog and I am beyond excited to see what the future holds. The sky is NOT the limit. The main goal is to keep working towards focusing on business growth. My passion is my photography business! And it makes me very proud of what I have created for my family, friends and clients. This past year, I have experienced a lot of growth in my business. My faith, dedication and patience have helped me along the way. Success does not happen overnight. Never stop learning! This is what sets you apart in this industry, or any other. Continuing education is paramount in keeping up with the constant changes in your awesome chosen field. Gather up as much information and knowledge as you can, and don’t jump into it too fast. Learning the business side is just as important as learning the artistic side of any business. Take the growth of your venture in stages. Master each one before going on to the next. 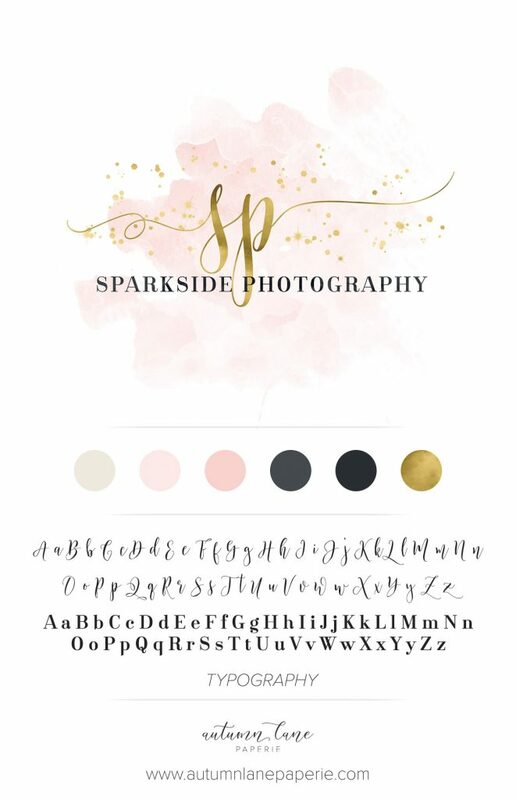 For easy and affordable branding, turn to our professional design team here at Autumn Lane Paperie! We’ll guide you at each step along the path to your unique and memorable identity, and position you for success. If you’re ready to update your photography logo or photography website, we’d love to hear from you! Searching for a candid, natural light photographer in the area of Anchorage, Alaska? Rhae Anne Photography! Pictured here, you see a beautiful example of one of her photo book pages for a mountain meadow engagement session. Give Rhae Anne a shout to schedule your own personal photo shoot! Rhae Anne lives in Anchorage, with Tommy, her husband of 21 years, and their two amazing teenagers, Kya who is 18, and Shea who is almost 16. Over a decade ago, Rhae was working with her church’s youth program. And she needed a miracle. Standing at her parents’ kitchen window, trying to comfort a fussy baby while watching the snow fall… tears falling, she prayed out loud, “Lord, please help me to find a job where I can be creative, and work with people AND get paid!” Little did she know where it would lead. But God heard, He knew, and He answered. First, Rhae began by editing photos she had already taken and posting them to her new Facebook account. (At the time, she still had a MySpace. LOL!) So putting up her Facebook page was an inspiration, because back then, ALL your friends saw ALL of your posts. People started asking to have their family photos taken for Christmas, or their Senior’s photos… and so it began. The best advice for someone just starting out is to not compare yourself to other photographers. Don’t be afraid to show the images that are YOUR favorites. Keep shooting and practicing. Next came Rhae’s Instagram page, showcasing more of her beautiful photo art. From there, she found herself soon engaged in a full time business. It’s most definitely full time for about 6 months out of the year, and then a little more than part time, the rest. It’s very ’seasonal’ in Alaska. Rhae begins with a phone call to clients, to discuss outfits and possible locations. Also — very important especially for moms with youngsters — a few tips on how to make the session go really smoothly. The example Rhae likes to give is that photo sessions are a lot like going to church. Mom wants everyone clean, and well behaved. The stress level for looking and acting appropriately, as well as needing to be on time, is usually through the roof. Mom would appreciate it if Dad didn’t show his lack of excitement too much. And then, when Rhae mentions that there is always some sort of argument or “loud discussion” that erupts just before they get there, that’s the icing on the cake. It puts her clients at ease, knowing they aren’t the “only ones”. She likes to tell Mom to just breathe, and Rhae will hold the reins, so to speak, and it will actually be fun! After they meet, and have completed their session, then they’ll receive an email with a link to their online album. They then get to choose which images they want on their flash drive. BUT as part of this “new launch” and new branding, Rhae will be offering more of an IPS service to clients that want more than a flash drive of images. They want prints of their beautiful family or senior displayed on their walls to enjoy! Rhae Anne is super excited to start offering beautiful products to her clients! It feels like that has been the missing piece for a long time. Kind of like starting projects, but not quite finishing them. For example, handing off a flash drive to clients felt wrong… especially knowing their excitement was to eventually have these images displayed in their home, or to make a keepsake album. This new service will help them accomplish this! When Rhae contacted Autumn Lane Paperie, and was connected with Lily, the first request was that the yellow birds stay as part of the brand. When Rhae and Tommy met in Kona, HI they were instant buddies. It seemed like each time they were together, they’d always see these yellow birds that travel in two’s. They are known as the Hawaiian Love Birds. It became a little game when they saw one, to look for the other because it was always close by. When they talk to couples now, especially new couples, Rhae and Tommy encourage them to stay buddies. NO MATTER WHAT. They may argue, or have long seasons where marriage is just hard. But when you’re best friends, you find a way through to stick together. So the yellow birds symbolize that. Okay, back to the photography logo + brand! Rhae also asked Lily to keep the same font, so her clients would still recognize the brand quickly, keeping that familiar touch they’d become accustomed to! Rhae’s biggest obstacle was… herself. Being afraid to be fully ‘Rhae’ as an artist. Trying to keep up with trends vs being true to her own craft. This past year she feels that she’s become the most comfortable she’s ever been as a photographer. She can say No to jobs that she’s not excited about, and say Yes to the ones she really wants. It’s liberating! For proof, look at that smile! People skills are what have kept her in business. Making someone feel better about themselves when they leave than when they arrived is the best feeling. Having the husband say, “This was actually super fun, and I won’t complain next year when it’s time to do family photos,” is pretty sweet! Also teaching the art of photography is another passion. Sometimes people arrive to class with “the look” (The look is, “I’ll be shocked if I actually learn something”). When they leave with a new found excitement to use their camera in manual mode, it’s also pretty stinking awesome! 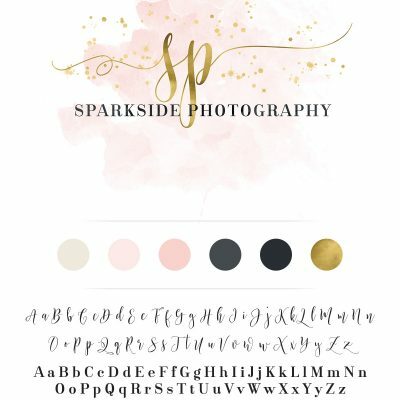 Ready to brand your own business with the Autumn Lane Paperie design team? Check out our Basic Business Branding Package and let’s get started!